Provo, short for Provolone is a two year old Pit Bull mix who was rescued along with his whole litter by a local dog rescue group. (He and his littermates were all given cheese names like Brie, Gorgonzola, etc, which is why he ended up with the name Provo.) He was adopted by a nice couple in the Washington DC area who took him to dog training class where he learned his basic dog training commands, however he always had issues with getting overly excited when he saw other dogs and squirrels, as well as being terribly excited when someone would come to the door at home. These issues weren’t resolved in dog training class, in fact, as Provo grew larger, and stronger, they began to get worse. The turning point came one day when Provo was just under two years old. Provo’s “excitement” at the door, with maturity, had become a bit more aggressive and protective, and one day when a delivery person came to the door, Provo was able to get out and bit the person on the leg. Luckily this wasn’t a bad bite, but it was enough of a wake-up call for his people to call the dog rescues where they got him, for help. 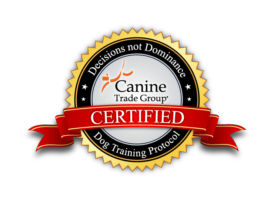 At first, because they had been told by their previous dog trainer that aggression issues are very difficult to work through, they wanted to return Provo to the rescue. Luckily, the rescue group suggested that they call me. When I met Provo he engaged in his normal barking and posturing at the door, but when he realized that I wasn’t afraid of him, he was perfectly happy to allow me to pet him. He remained excited, and while his owners would constantly tell him not to jump and to be calm, he of course wouldn’t listen. We took Provo out on the leash and I observed his leash behavior which was pretty non-focused, and I also watched the way his people interacted with him. When I met Provo and his family, I was also lucky enough to meet Trudy, one of the rescue’s dedicated volunteers, who had fostered Provo as a puppy and wanted to observe his training. While his people called me for his developing aggression issue, I explained to them the importance of working through all of his issues, both the obvious and the somewhat subtle ones that they often let go. Things like Provo needing to be asked several times to do things, and his general unreliability with basic dog training commands like the “stay” command. It would be through everyone’s mastery of the basic commands that we would be able to start a program of desensitization with Provo so that he would learn not to become so excited, and aggressive, when he meets new company, dogs on the street, etc. Provo has a spot he likes to lie in by the door that guests would approach, which happens to be glass, so he can watch people come through the gate and walk up to the door, and by our second session, he would watch as I walked up, bark once to let his people know I was coming, then greet me in a completely calm manner. By our third session when we worked with Provo outside we were able to ask him to lie down and we let go of the leash while we talked, and he stayed there calmly even though there were construction workers across the street. This would have normally sent him running over to investigate. Provo and his family are living a much calmer and reliable life, as are the neighborhood’s delivery drivers!